For Your High Bay Ceilings?" If you have high ceilings then you may need to consider garage specialty lighting in order to properly light the area. Most fluorescent garage lighting fixtures will do the job up to ceiling heights of ten (10) feet. After that, you will need a different type of garage lighting fixture in order to get an even distribution of light throughout the area. For ceilings that are from 10' to 15' in height you can use a garage metal halide lighting fixture like the one shown at the left. 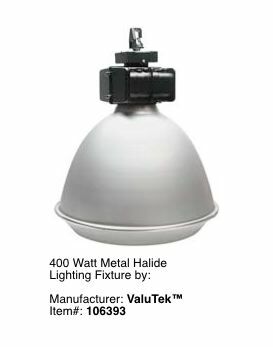 This garage lighting fixture is manufactured by ValuTek™ and comes in the 22" diameter size with a lens that is designed to focus the light for precision optical control within the work area. 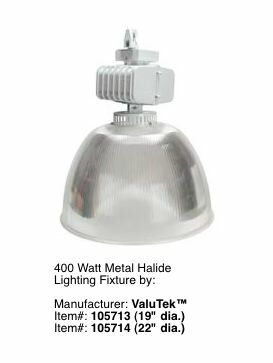 The fixture has a lightweight die-cast aluminum housing and comes equipped with a 400 watt lamp and mounting bracket with each unit. It features a quad volt ballast that is securely mounted in the housing. This garage lighting fixture generally retails for below $175.00 and the 400 watt lamps below $20.00. If you have ceilings higher than 15' in height then you may want to consider the garage metal halide lighting fixture shown at the right. This garage lighting fixture is manufactured by ValuTek™ and comes in 19" and 22" diameters. The 19" diameter unit is tight focused with an aluminum reflector and the 22" diameter unit is evenly diffused with a prismatic refractor. The fixture features a quad volt ballast securely mounted in the housing and can be wired for 120V, 208V, 240V and 277V and comes with a 400 watt lamp and mounting bracket with each unit. Either of these units are ideal for high-ceiling garage lighting and will distribute plenty of general or focused light depending upon your use and garage specialty lighting needs. Consider them in your garage lighting plan design if you are planning on high ceilings. Garage Tips: High Intensity Discharge lighting, commonly referred to as HID lighting, requires a special fixture and ballast for each type and wattage. The lamp wattage must be matched to the ballast rating. Using the incorrect lamp in a ballast can result in premature ballast failure. Visit our page, Garage Exterior Lighting to learn about the variety of exterior garage lighting fixtures that give high security for the exterior of your garage.